The Discoverer S/T Maxx tire from Cooper is a commercial grade traction tire designed for light truck applications. The Discoverer S/T Maxx tire from Cooper is a commercial grade traction tire designed for light truck applications. Featuring Coopers 3 ply armor-tek3 construction combined with a cut and chip resistant tread rubber compound. The S/T Maxx features a 4-5 rib hybrid tread design that was optimized for the toughest terrains. The S/T Maxx can handle off-road terrains while still maintaining on-road traction and stability. 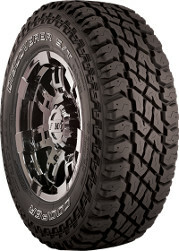 For the Cooper Discoverer S/T Maxx Tire, call or order from our online tire store today. For over 100 years Cooper Tire has been building high quality tires for all types of vehicles. Cooper offers an extensive line of extraordinary tires with a extended tread-life, superior traction and a smooth ride. Safe and reliable high-quality tires are the founding principles of the Copper Tire brand. Cooper tires are sure to have a tire that will provide you with excellent mileage, and tread wear, assuring your comfort, handling and safety. Cooper tires are designed and built to provide consumers with thousands of miles and excellent safety.